Great Job... It looks awesome and I'm lovin the budget curtain rod!!! My name is Diana too :) I just found you and I'm your newest follower. I hope you can visit my blog and follow too if you like! Hi "Diana" ;) Checking it out now! Thanks for following and welcome! Beautiful!!! Love the planter boxes and the curtain rod! I absolutely love your porches! The are so inviting. I enjoy your blog very much. Thanks Joyce, for taking the time to visit today! Copper prices are crazy! But I was so happy with how "copper like" this spray paint was. Yay! I love your blog and all of the tutorials!!! Thanks for sharing!! Gorgeous!! I could spend hours on your porch. I love the spray painted rods and the chalkboard herb pots! p.s. Just found your blog and I love it- I'm your newest follower! do posts when you try out the herbs! I am curious on the purple basil also! Thanks Beth! I definitely will! I have searched for a long time for curtain rods for my extra wide windows in my den without spending a lot of money. My search is over. I will making 3 of these rods. Thanks for the inspiration. Another GREAT idea, simple and inexpensive. Honestly, I was surprised you didn't use your go to "Oil Rubbed Bronze" spray paint, lol. Love the porch....... thanks for the tip on the awesome curtain rod. I bit Lowes will cut the pieces for me !!! Your porch, as with the rest of your home, is beautiful! I've spray painted a lot of things around my house with metallic paint. Things like TP holders, canister tops and even the transition on the floor between my family room and kitchen. I've found that with those things that get used everyday, it helps to use a clear coat as a top coat to prevent chipping. I'm going to try and do curtains on my front porch since yours are so pretty--thanks for the inspiration!! Love the herb names on the flower pots. What do you use? I've always loved your back porch...you've made it so homey and beautiful. And what a great idea to use spray paint to get the copper look without the copper price! Everything looks great as always! Thank you Judy! Have a great day! I LOVE your Blog! I want your house! You are a very talented lady! I usually enjoy my morning coffee ewing and awing, (drooling a little bit) over the things you have created! Thank you! What a great back porch! Excellent idea for the curtain rods, too. Thanks for sharing! This is sooooo cool! I love the painted floors on your porches! It adds so much! You are so creative and you and hubby have your home looking like a show place. Thanks so much for sharing! Your porch looks fantastic! I think I would spend my whole day out there if I owned it! So, so, cute. Love it. I love everything about this! So pretty! I love the fabric on your pillows...looks like ticking fabric? Where did you get it? I LOVE IT! I am still so jealous of your front porch... I didn't know you had 2!!!!!! Jealous! That is near the top of my list for our next house. Anyway, I LOVE the curtain idea and I can't believe how awesome that PVC looks after being painted! I feel totally inspired to do something with PVC now, hmmmm?!?! This is SUCH a clever idea!! Pinned! Love your porch! well, and all of your ideas actually!! Is there anything you can't make? Amazing. Love your blog. Now if I can try and do half the things that you do. Ha! What did you use to write the names on the pots? Looks like chalk. Another great outdoor space, Diana! You took what could have just been an ordinary utilitarian entry and made it special and a spot to stop and enjoy. I find the less resources I have the more creative I become but you are one creative lady! I love your ideas and how you put things together to get just the right look. Can't wait to see your future projects. oh I so want to do this to our new sunroom addition we are going to build..love it...thanks for the idea..your porch looks fab-u-LouS!!! I had no idea the curtain rods were pvc until I saw the tutorial. Fabulous! And you have just inspired me for the spot on my porch that 'needed something.' Thanks for sharing! I just came across your blog via a pin that I loved on Pinterest. I am in complete awe of your home. I'm trying to find some words other than perfect. You've done some amazing work! where did you find the rings to hang the curtains and what do you do when it rains?? HOw is everything holding up? Hi Jallen, I already had the curtain rings, they were wood and I spray painted them as well. The curtains are painters drop cloth canvas from Lowe's. They hold up very well to rain and weather. I hung them last year and have only had to wash them once. Oh my goodness, I love this! Your back porch is perfection! Your side porch is extremely lovely. I'm new here so was just browsing around and couldn't leave with out saying how nice your house is. What a gorgeous back porch! I'm so inspired and definitely will try the curtain rod project. Thank you for sharing your ideas and projects!!! I have just discovered your blog and I love it after one post. I'm your latest follower. I did read the story of your bread boards. A lovely story about your Dad. I posted one the other day about the white oak baskets I used to make with my Dad when he was living. My problem about bread boads is my love of them and my extreme respect for the beautiful wood....I won't use them for cutting. I will use a commericial board-but can't seem to use a beautiful hand-crafted board. Looking forward to reading previous posts. Where did you get the rust-oleum? So interested in doing this!!!!!! I am absolutely in love with your blog. I only wished I would have found you sooner. I found you when I saw you featured at West Furniture Revival. I'm your newest follower! Q-how is the painted plastic (curtain rods) holding up? just wondering if it scratches at all as you open and close your curtains. or maybe you don't and they are more decorative? thinking about doing this (in "iron"/black) for my son's room. Hi there! I am in LOVE with your blog and your decor style. 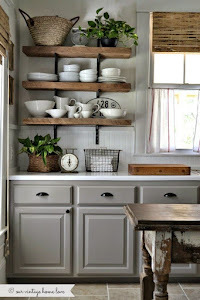 I just came across it after clicking on a Pinterest pin (the pallet bench -- love that as well!). I have wanted to hang curtains on our front porch for a while now, and I am totally using your idea for curtain rods. I do have a question for you though -- where did you get your curtains and/or what kind of fabric are they? Thanks! Love, love, love your porch, blog etc. Awesome ideas! I'm going to become one of your fans and followers. Can you tell me where you found your awesome oars? I see you have them in several areas of your house and I'm looking for some to mount on a wall. The one's I've found (PB) have been sooo overpriced. Looking for a copycat supply house. Not sure what I love more about your porch curtains. The fact that the curtains are painters cloth or the copper pvc. Brilliant. Wow! That is exactly what I have been needing help with!! I am also curios about how the paint is holding up with sliding the curtains back and forth. Would love to hear! Love this! The whole porch looks great but I especially love the DIY curtain rods. I have been on the hunt for cheap curtain rods and I think this is an amazing idea. I hope you don't mind if I feature it in a post on curtain rod ideas tomorrow. Classic set up. It's my ideal look. Such cute ideas! Did you just use chalk to write on the flower pots? I love that idea! I also liked how you displayed the candles as well. I've seen a lot lately people who have added extra lighting to their porch and it has turned out way cute. This makes me want to buy some new affordable outdoor furniture and get started decorating! Would you have to remove the entire assembly in order to wash the curtains? Hey Diana, Love the Copper Curtain Rod idea. Thank you for sharing. I have almost completed a large (24 x 24) porch addition to our house and my wife and I are about to try our hand at making some outdoor curtains for it from some Sunbrella-like fabric using grommets. These curtains will get used quite a bit I would think as we have a recessed projector in the ceiling and we will watch movies out there. The porch is open on 3 sides so we have about 75 feet of windows to cover. Your curtain rod idea is perfect since I have used copper and bronze "hammered" paint to cover everything metal already. The "copper" rods should blend right in. How are they holding up? Are you still happy with them and would you do anything different? Thanks again. I found this project on Pinterest and followed it here :o) Your blog seems right up my alley. I've been planning on doing a curtain rod exactly like this in my children's play room, and this is GREAT! I was wondering one thing about how the paint holds up to the rings moving across it. I supposed it doesn't get much movement on your porch, but thought I'd ask anyway! Thanks! I also spotted this gem on Pinterest and it's a perfect solution for my back porch. I have a overhang similar to yours but it's cement or plaster or something. Are your made of wood? I'm wondering if I'd be able to screw them into mine. Thanks. Your porch is beautiful. It looks so quiet and inviting. Love it, and the curtain inspiration! Thank you for sharing!! Very creative outdoor porch.. The idea of placing herbal plants over the table is pleasing to eyes. LOVE your porch! I am in the process of buying my first house since my divorce...I'm so excited to be starting over with my boys and I in our own place! Been looking all over online for porch ideas! Found your site! Will be a new follower now! Such a gorgeous solution...you'd never guess what the curtain rod is made of! Thanks for the excellent tutorial and for sharing the results of your stunning porch makeover! I'm not the only one to love it, your blog has 270+ repins on my Backyard DIY board. Congratulations!! I know it's been a while since you did this project and posted this, but I too was wondering how the rods are holding up. Also, what diameter of pvc did you use? Beautiful work! This looks great! I'm just wondering how it held up over the years. I'm thinking of using the metallic paint on pvc for a garden arch and I'm worried that it will peel or wear off quickly.